thought this cute little die would be perfect. This pretty die is called Butterfly Flourish and can be found in the store. I cut out 3 different sets, each in a different color. I cut the apart and layered each cutout on top of the previous one for a little pop of color and dimension. Thanks for stopping by to see my make. Don't forget to visit the FaceBook page and stop back at the blog for more inspiration from our design team. 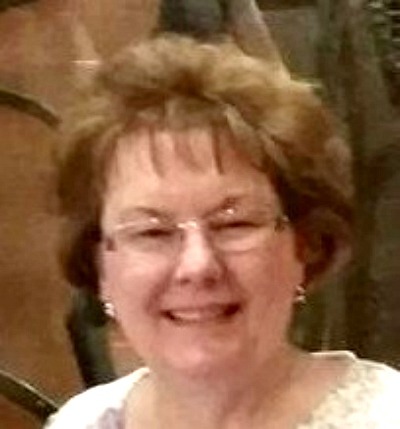 Melinda here and today is my turn to share. 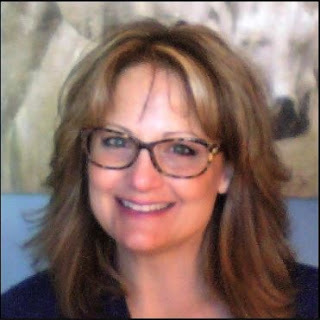 I will be sharing every Tuesday and I have decided to call my posts….Terrific TuesDIEs! 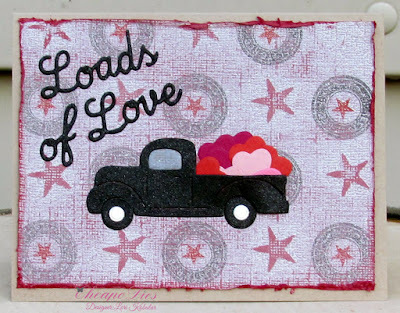 This week I am sharing a project I created with the Love Wreath Die! Here’s a look at my finished card. It is a standard A2 size. The base was white cardstock. 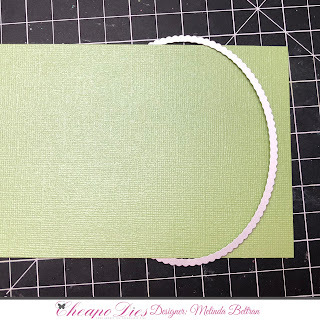 I used green and pink cardstock for a mats. 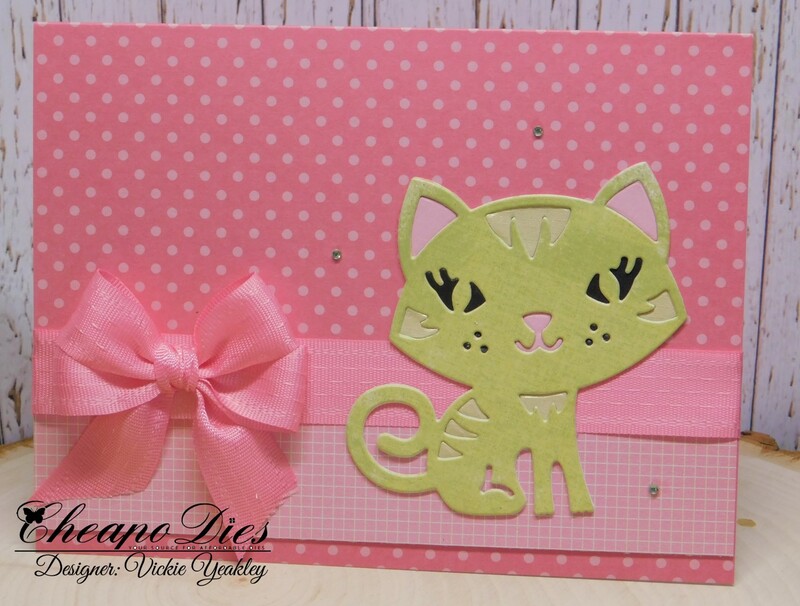 I embossed the pink mat to add the pretty texture. Next I used the oval scalloped stitched dies to cut a couple of mats. 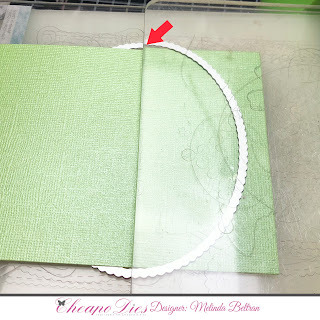 I embossed the smaller oval mat with the same embossing folder as the pink one. I then cut the love wreath die out twice from white cardstock. I colored the die cuts with my Copic markers. I layered the two die cuts with a little foam tape so that the leaves would have a little movement. I finished off the heart with some stickles and added some Nuvo Crystal Ivory Seashell drops to the centers of the flowers. I used the smallest oval stitched scallop die to cut out my sentiment. I added a gold stitched white ribbon. Position the paper under and over the die as pictured. I used the scallop stitched oval dies for my mats. I used the two largest dies in the set. Prepare your die sandwich. 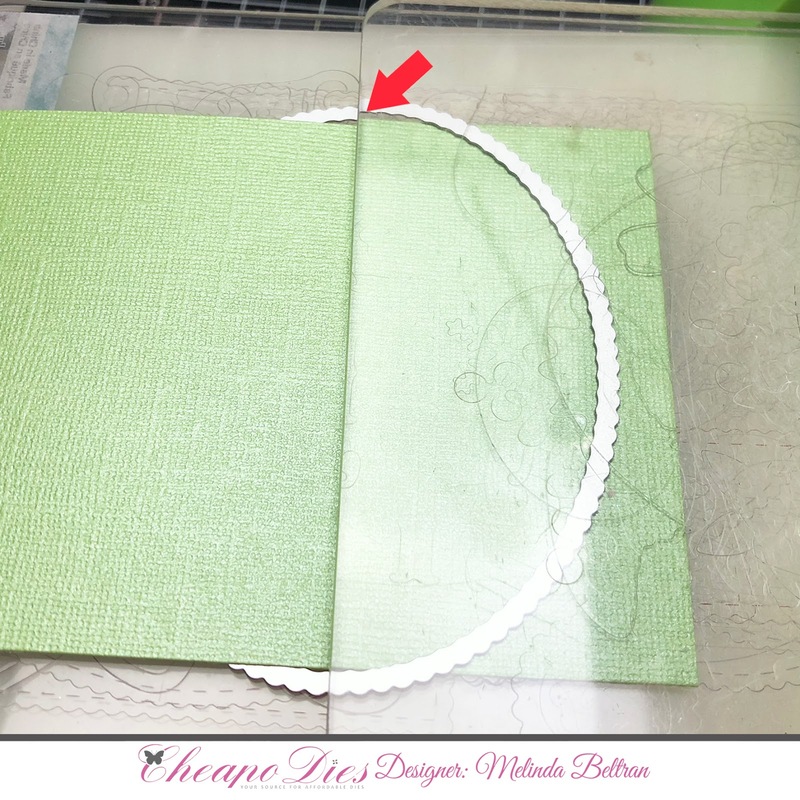 Place the top cutting plate only to the point where you want the die to cut the paper. Doing this will prevent the paper from creasing as the die and paper go through your machine. Remove the paper and you will have a perfectly cut edge! Be sure to pin this image for some inspiration! Thank you so much for sharing your crafty time with us. Be sure to follow the blog and check in for some daily inspiration from the other designers! Until the next time, have a wonderfully crafty day! 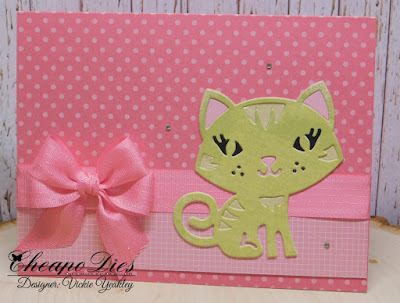 Gloria here, today I want to share with you a couple of clean and simple style cards using Hello Spring die from Cheapo dies. To create these cards, I started by drawing a Spring image on a watercolor paper panel using water brush for my own background. I then die cut the colored paper with the gorgeous Hello Spring die. Next, I die cut on a white card stock with the same die. I made two cards with inlaid die cut technique. 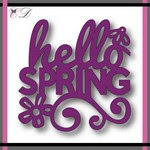 I'm waiting Spring very much so I love this message. It's Connie Can Crop here and my first day to post with Cheapo Dies! I can not begin to tell you how awesome these dies are! They are made really well and they work perfectly in my Cuttlebug. They cut like butter too! And you can't beat the awesome price!! If you have not checked them out yet be sure you do! You won't be disappointed!! 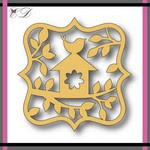 My first project is this Spring card featuring this gorgeous die, Birdhouse Tag. 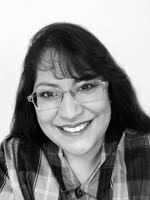 Lori here, this is my first post as a member of the Cheapo Dies Design Team and I am very happy to be here!! I really love the details of these dies, they cut like butter! I think once you try one of these dies you will be hooked on them like I am! 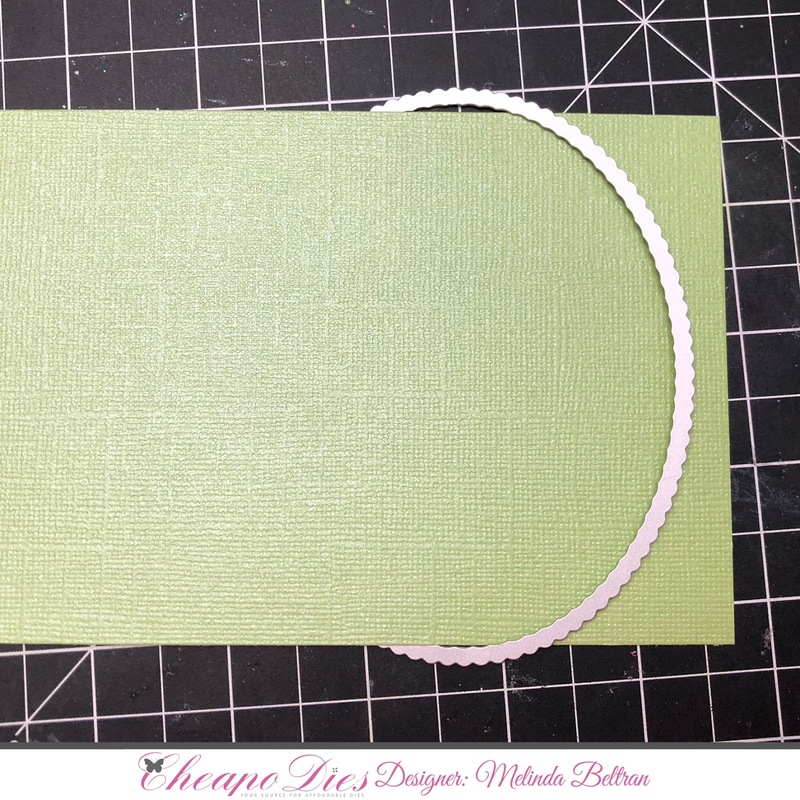 For this A2 card I started with Kraft card stock for the base of the card. Next I took a piece of old Core'dinations paper, sanded it down and then distressed the edges and added that to the card base. Next I got my papers together to cut out the die. I took the truck from the Loads of Love die and some black shimmer paper and cut out the truck. I took some pink and red scraps and die cut out a bunch of hearts and layered them in the bed of the truck. I took some silver paper to cut out the hubcap and added that to the tires. I took some blue vellum paper for the window. I cut the words out with the same black shimmer paper and added them to the top left hand corner. Now isn't this just the perfect card for any Guy out there?? 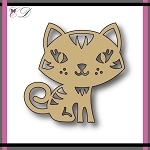 Be sure to stop back often to see what the rest of the Design Team have created with awesome new dies!! Anne here with my first post for Cheapo Dies. I'm very excited to be a part of this new team and new company. I'll have something new for you every Friday and hopefully it will inspire you to create something with these fantastic dies as well. These dies are nice and substantial feeling, not flimsy like some of the name brand dies I have in my stash. 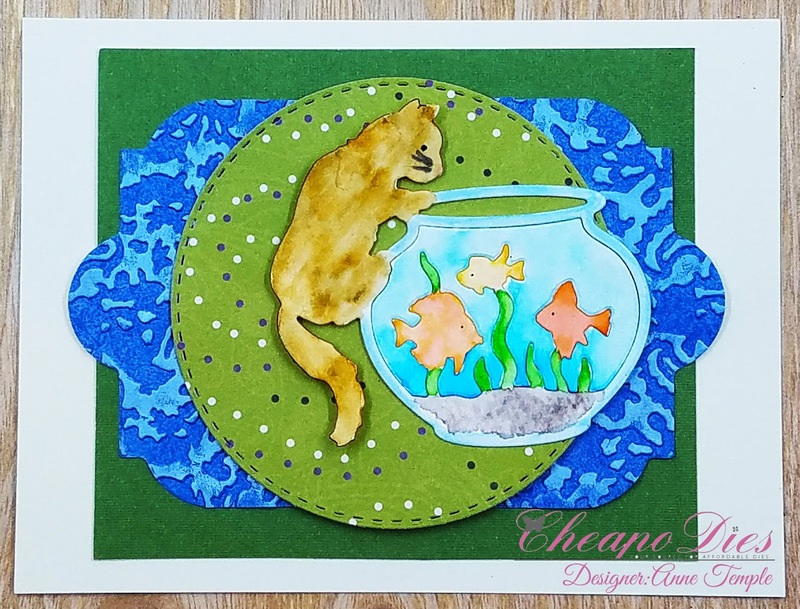 For today's card, I chose the Curious Cat die and die cut it out of watercolor paper. I used my Zig Clean Color Real Brush markers for coloring the die cut. This was quick and simple to do and I added his whiskers with a Copic marker. I adhered the Curious Cat to a circle die cut making sure not to add adhesive on the cat itself. After the water dried from the cat, it had some natural dimension and I wanted to keep that look. You can see the natural shadows it created when the photo was taken. 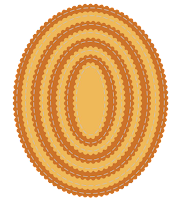 The die cut was layered onto a basic circle shape (any of these circle dies from Cheapo would work well) and another basic shaped die cut was used for the mat. 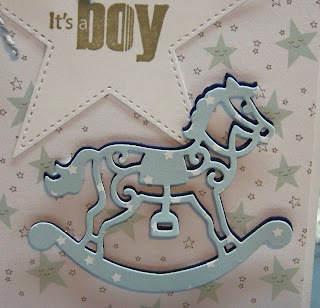 This blue mat was dry embossed using a Sizzix embossing folder (Damask). Nuvo Embellishment Mousse (Cornflower Blue) was applied on the top of the raised areas and really brought them to life. It reminds me a little bit like rippling water. This is a great die as you can create something quick and simple, like I have here, or more elaborate. 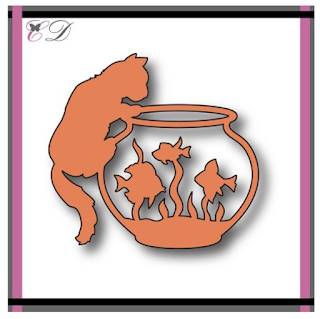 I can envision lots of glitter on the fish and water and flocking on the kitty. Maybe a project for another time 😀. For more details, please visit my blog, Anne-Made. Be sure to come back everyday for some new inspiration from our Designers. Hello and welcome to Cheapo Dies! 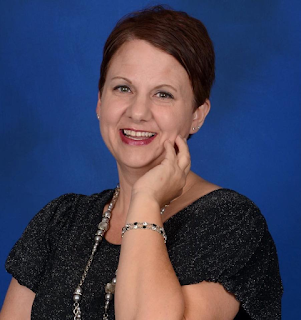 I am Vickie Yeakley AKA Vickie Y in the craft world and I'm very excited to share my first project with you! 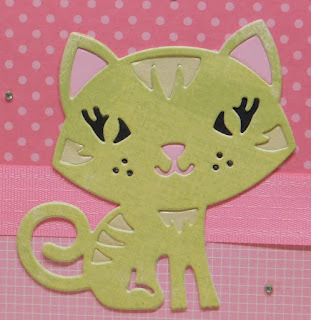 For my card, I used the Cheapo Dies Exclusive Cat die. Love the size of this sweet cat image. I first die cut using a piece of scrap designer paper then die cut again using 3 colors of cardstock to have to have the negative pieces to inlay into the die cut image. 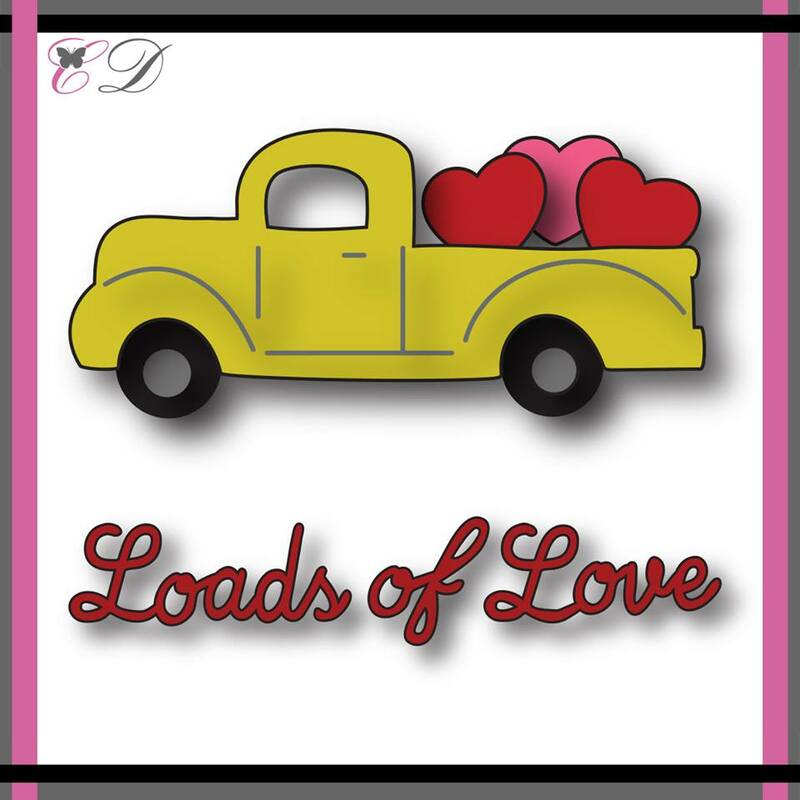 Be sure to also check out the Cheapo Dies Facebook page. Welcome! So glad you stopped by to check out what's new with Cheapo Dies. DT Carolyn here to share a sweet little project featuring a cutie of a die. Isn't this giraffe adorable! I thought it would make a cute baby card. The die I used is called Giraffe and is available in the store now. I like that the die cuts holes in the image, that way you can used a background paper adhered to the back of the diecut for a different look. I used 3 different types of paper for this die and decided to stagger them to show off the colors. I added a sweet sentiment, used pop-up dots for dimension and put it all together. 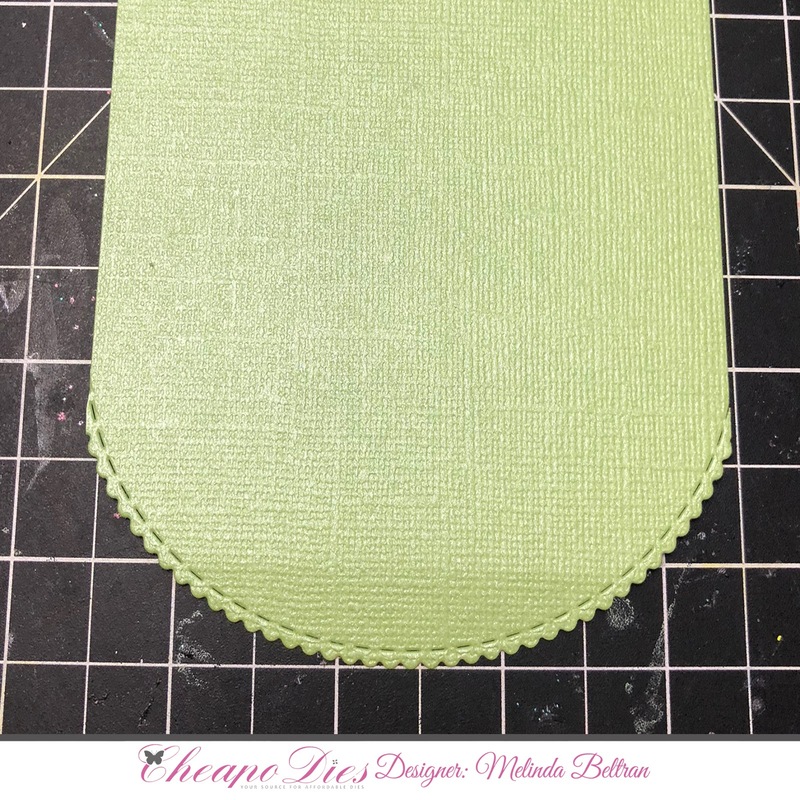 This die cuts crisp and clean so there aren't any ragged edges, perfect for that special project you want to get just right. Thanks for stopping by! Check back daily for more inspiration from our talented design team. Also, stop by the Facebook Group for more inspiration! just perfect for a baby boy. The focus of my card is the Cheapo Die Rocking Horse. a tiny star designer paper, layering the darker under the die cut\for a bit of a shadow. just by changing the colors. and very affordable dies in stock. 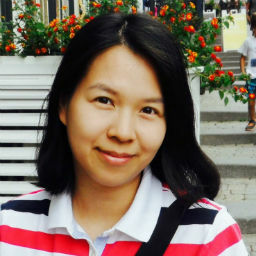 My name is Melinda. I am super excited to be here today and be part of the 2018 Design Team for Cheapo Dies. Like many of you, I love, love to craft but often find myself on a limited budget. So finding great quality craft items at an affordable price is always a big deal! I hope my time here will encourage you to check out and invest in what Cheapo Dies has to offer! I will be sharing every Tuesday! 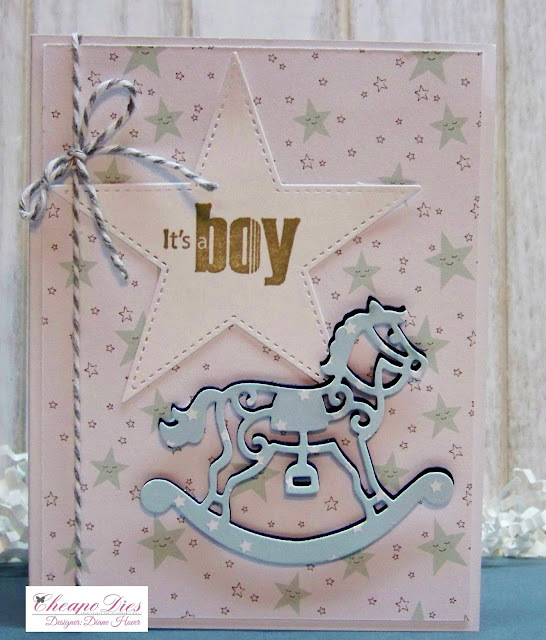 For my inaugural project, I created a card using the hanging light exclusive die. Here’s my project. My card is a standard A2 size. I used some patterned papers from some paper stacks in my stash. My card is of white cardstock and top folding. I started by cutting out the Hanging Light Die I used from some plain white cardstock. I then used my Versamark ink pad and embossed some Stampendous moonstone embossing powder onto it. I repeated the process twice so that I would have a nice thick layer of embossing powder on the die cut. Here's a little bit closer picture to show the thickness of the die cuts. I used the oval scalloped die to cut out the thinking of you sentiment. I used the scalloped rectangle die for one of the mats. I used the Nuvo Crystal Drops Gray Mist for a subtle extra touch. I used some Robin's Nest Cotton Candy Dew Drops for a decorative touch at the top. I also used some Gray ink to ink the edges of the larger patterned paper mat. I added a final touch of a cute bow with some seam binding ribbon. You can head over to my blog for more details. Be sure to head over to Cheapo Dies Shop and check out how reasonable they are. Make sure you come back and check out what the rest of the design team will be sharing. Until the next time, Have a wonderfully crafty day! Today I get the honor to show you my first Cheapo Dies card as a designer of Cheapo Dies team. I feel very blessed to be given this wonderful opportunity, and look forward to sharing lovely Cheapo Dies product with you . With the Cupid Die, I made a fun and cute Valentine's day card. 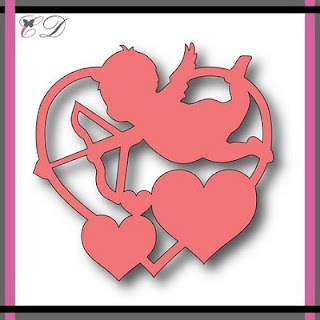 To create this card, I die cut the cute cupid image from black card stock using the Cupid die. I then made my own background with Distress Oxide inks using mini blending tools and trimmed it out using paper trimmer. I mounted it using double-sided tape first, and then add the sentiment banner using foam tape. Then embellished this the purple shiny sequins. For detail, please visit my blog here. using the amazing and very affordable Cheapo Dies. 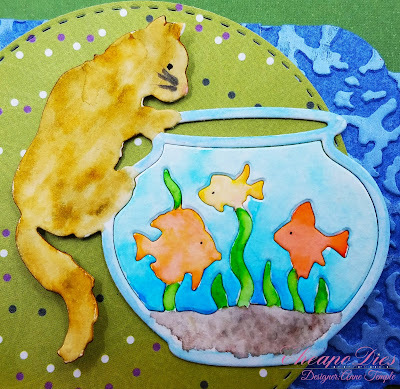 Guest Designer Darlene from Dar's Crafty Creations to step in and help out! 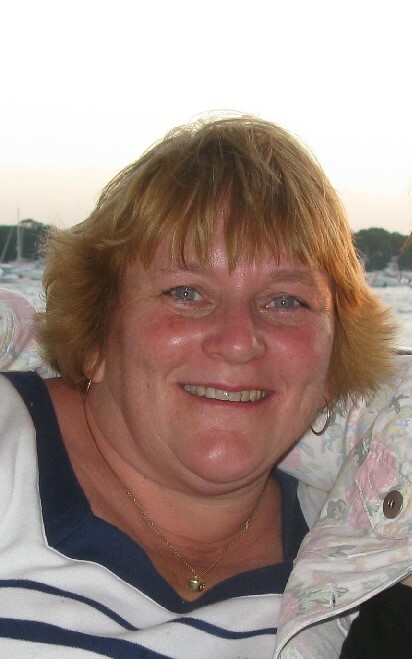 as well as half owner of the Double D challenge blog with myself. I want to thank Darlene sincerely for stepping in to help. 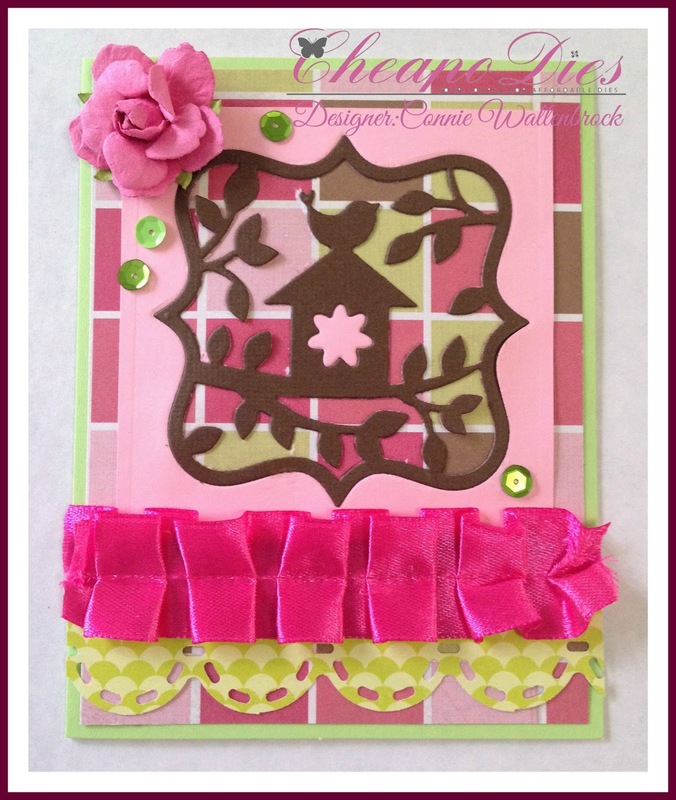 Darlene made a card using the new die Sideview Butterfly. Isn't it a beautiful card? To read all about it, please visit Dar's blog HERE. Once again, thank you Darlene. Please stop back tomorrow to see another of these amazing dies in use! but, before we do that I want to thank everyone that applied. It was a very hard decision, but one we had to make. team as I am sure you will enjoy their creations as well. 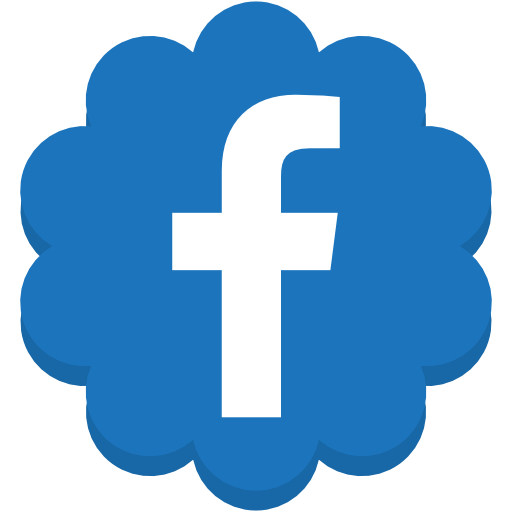 We would love to have you follow our blog!